Team VeryGames closes by the end of 2013: Where will the team go? One of the biggest organisations to support CS:Source and CS:GO competitive play is closing its doors before the end of the year. As Team VeryGames heads to Dreamhack Winter for the largest CS:GO tournament to date, they are not just looking to showcase their skills: They're looking for new sponsorship to achive their goals in 2014. A lack of financial support is thought to be the reason for the French organisation's withdrawl from eSports. The costs for the successful and ambitious team are said to have "trippled", giving service provider, VeryGames, no choice but to shut their eSports team down. So many things to tell... imperishable memories, meetings, trips... An experience that made me more mature... Here are the first thoughts that come to my mind. As it is time to make the review, I think we can be proud of what we achieved together. What we often forget is that the team's success is not only due to its players talent. The environment is key and we had the chance to work in trustful and safe conditions throughout the last 4 years. Team VeryGames has been a motivation for us and even beyond, for many competitors in France. Without this project, we would not be here... This is the reason why I want to thank Johann who worked his heart out and involved so much means to bring us to what we are now. Thank you to the players and to the many volunteers who participate in our project, thank you to the VeryGames people, thank you to Razer and Drew for their support and obviously thank you to the fans... but the journey is not over, we still need you! GO VG! The past few years have seen eSports Team, VeryGames, consistently challenge the top spots. 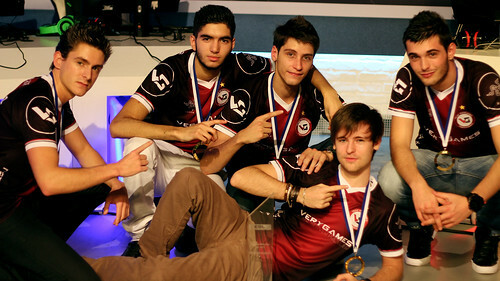 Then came the transition from CS:Source to CS:GO, which left Team VeryGames in second place behind Ninjas in Pyjamas. That is until they claimed the RaidCall EMS One Summer 2013 Season title. Having now beaten NiP once again in the Fall 2013 Final, the French organisation is on par with NiP. Team VeryGames was on top form between 2010 and 2012, when they took multiple titles on both a national and international level in CS:Source. They were consistently one of favorites to win big titles in the French ESL Pro Series, ESL Major Series and later the RaidCall EMS One. Is a big signing ahead of NBK and his mates? The EvilGeniuses tweet embedded above has lead many to speculate that the organisation will be picking up the French team. Others are suspect Alliance will make a play for the pro-gamers. Only time will tell. Below we take a look at what they have achieved so far and why the best organisations in the world should consider picking up this team. We at the ESL wish them the best of luck picking the right organisation and all the best for the upcoming 2014 tournaments! Hoping they find a great organization, they are currently the best team in CS:GO! Rip sick to see you go GL !